Last year, OCP began offering Board of Certified Safety Professionals training to become a Safety Trained Supervisor in Construction (STSC) to all Foreman, Superintendents, and Project Managers in order to ensure safety is thoroughly understood and enforced by all. Currently, OCP consists of 36 individuals who have obtained this prestigious title. As OCP continues to prioritize safety in all practices, we have set a goal to have 50 STSC certified individuals throughout the organization by the end of summer. Potential hazards are eliminated in the engineering phase of a project. For example, engineers thoughtfully design a 40-inch parapet around a roof versus the 36-inch that is commonly seen on buildings to physically remove hazards from the job. Job materials that could potentially be hazardous are replaced with safer alternatives. This is most commonly done by substituting chemicals or tools for ones that are less hazardous. Safe work procedures are put in place to separate staff from the potential hazard; such as guardrails utilized in a fall protection situation. Administrative controls are put in place to ensure people are working safely, such as training or job rotation. 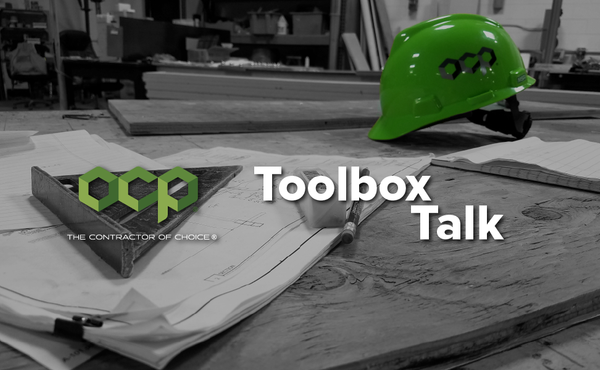 For example, in a fall hazard situation employees are trained not to go into certain areas on the job, through the use of on-site toolbox talks or warning signage. Furthermore, everyone is trained on best safety practices so that educated decisions are made on-site with safety in mind. Personal protective equipment (PPE) is utilized at all times to protect employees while on the jobsite. Such as the many lines of protection that OCP has in place for fall protection hazards. Always remember to utilize the hierarchy of controls when addressing all hazards: elimination, substitution, engineering controls, administrative controls, and PPE. If you have any questions, any of our STSC certified professional on staff are always available for assistance.